If you were asked to identify one way that a changing climate was affecting your park and recreation system, what would you pick? Would it be sea-level rise, drought, coastal and river flooding, extreme heat, invasive species, ice storms, hurricanes, more frequent and intense thunderstorms or deluge rain events? The list goes on, but it is a pretty sure bet that everyone in the field of parks and recreation has a story to tell about how a changing climate is affecting their parks, their workers, their programs and the people in their community. And, for some, the shocks and stresses have been unbelievable — 50 inches of torrential rain within four days in Texas; blazing wildfires in California that scorched hundreds of thousands of acres of land, driving people and animals before wind-driven flames in a desperate flight to avoid being burned to death; daytime temperatures in Arizona over 100 degrees for three months straight and no relief at night because the temperature never goes below 90 degrees; and most recently, catastrophic spring floods in Nebraska, Iowa and other Upper-Midwest states. Weather events and weather patterns come and go, but long-term changes in climate are starting to profoundly change our environment. Parks are on the front line of these changes, and they must become more resilient to meet the challenges we all now face. 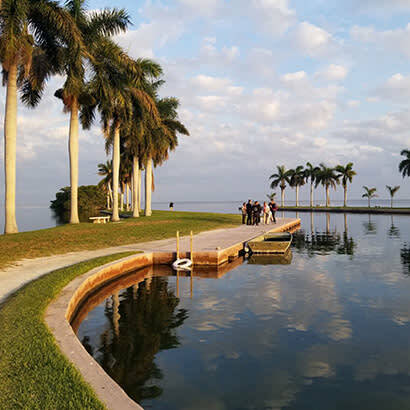 Making parks more climate resilient was the topic of NRPA’s latest Innovation Lab, held January 2019, in Miami in partnership with the Miami-Dade Parks, Recreation and Open Spaces department. NRPA’s Innovation Labs have quickly gained a national reputation for thoughtful treatment of challenging issues by a gathering of experts and director-level professionals to do a deep dive on issues as diverse as the impact of technology and the challenges of dealing with homelessness in parks. The two-day lab consisted of panel presentations, an interactive workshop on “Parks Leadership in Climate Adaptation,” tours of the Fairchild Tropical Botanic Garden, visits to Miami-Dade County’s parks that are under the greatest threats from sea-level rise and coastal flooding, and a special tour of the University of Miami’s Rosentiel School of Marine and Atmospheric Science, where lab participants had an opportunity to walk around, over and under UM’s hurricane simulator and see it cranked up to demonstrate the impacts of a Category 5 hurricane. Some 50 participants from around the country participated in the Miami Lab, where they heard expert presenters in the opening session give a national perspective on the resilience landscape in America. Amy Chester, managing director of Rebuild by Design, a project of the Van Alen Institute in New York City; Jason Hellendrung, vice president for Tetra Tech, a worldwide design and engineering firm; Kokei Otosi, project manager of Keeping Current, a solutions-oriented initiative targeting South Florida; and Jordan Wildish, a research analyst at Earth Economics, a think tank that applies market-based solutions to environmental problems, gave their thoughts on how cities must use a systems approach to first assess vulnerabilities, not just of physical infrastructure, but also of the health and well-being of vulnerable populations that are often the most affected by extreme events. Parks play a prominent role in a systems approach that seeks to provide multi-benefit solutions because of their recreational, public health, community development, economic health and environmental benefits through living shorelines, green infrastructure stormwater management and flood-control benefits. On the second day of the lab, a second panel, composed of Na’Taki Osborne Jelks, chair of the West Atlanta Watershed Alliance and professor at Spellman College; James Murley, the chief resilience officer for Miami-Dade County; Sonia Succar Rodriguez of the Nature Conservancy; and Tom O’Hara, a former managing editor of several newspapers and now project editor for The Invading Sea, spoke on the economic, environmental and social dimensions of resilience. Key takeaways from this session highlighted the environmental and social injustices of vulnerable populations that often have the least means to deal with acute shocks from extreme events, such as hurricanes, storms and drought. Presenters agreed that parks play a vital role in developing resilient communities because they are so strategically located within communities. Osborne-Jelks noted that “process is as important as results.” To gain community buy-in, planners and implementers of resiliency solutions must have a community-centered approach and engagement at every level — in planning, preparing and implementing solutions. One of the highlights of the Innovation Lab was an interactive workshop, led by Joanna Lombard, a professor at the University of Miami’s School of Architecture, that was organized around a Design Thinking Process that focuses on human-centric solutions. Working at tables on chosen climate resiliency topics, participants worked through a collaborative process to learn about their partners as they would learn about their own communities. It led to constructing a point of view based on user needs, to brainstorming and coming up with creative solutions and to building representations of their ideas through a prototype. Finally, the Thinking By Design exercise let participants test their ideas and share them with their partners. It was a highly stimulating and productive way to think about resilient parks and what it takes for them to become so through a full community effort. To learn more about resilient parks, log in to the March 14 webinar, “The Day After Tomorrow: Making Parks Climate Resilient,” on the webinar archive page. Richard J. Dolesh is NRPA‘s Vice President of Strategic Initiatives.